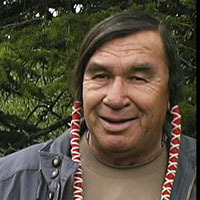 Curly Bear Wagner has devoted his professional life to fostering Blackfeet and Northern Plains culture through educational programs and research. For many years, he served the Blackfeet Tribe as Director of their Cultural program, and now serves as an independent consultant in the field of historic preservation and cultural tourism. Mr. Wagner shares his thoughts on native ideology and oral history. Everything is Living - Curly Bear Wagner. Oral Tradition - Curly Bear Wagner.